Lately I have been in a huge arts and crafts mood. When I was an art student I loved painting, sculpting, and crafting, but since becoming a drone to corporate America I simply did not have the time, space or resources to devote to being the artisan I used to be. BUT now that I started YORK SURF‘s line of jewelry, all I want to do is create more and more with my hands and I LOVE it! The artisan surfer is back! As you might know, I will be at the Greenwich Avenue Fair on July 28th and I have a ton to prep for the event – mainly I need to make enough jewelry to supply the demand of a seven hour fair! I’m not sure how much to make but the goal is to have enough to sell but also sell out close to the end of the fair. In addition to inventory, I also need a sign and a table but I simply did not want a standard table or vinyl sign from Kinkos. That’s just not my style and doesn’t live up to the brand’s standards. So yesterday I dragged my boyfriend to Jamali Floral Shop on 28th & 7th in the city and picked up some materials to make a bamboo table out of my old dinged up surfboard. I made a table once when I was an art major at the University of Miami. The assignment was to deconstruct the table and use the materials to make another item. I turned it into a trunk which was a breeze to make since I had a whole workshop, power tools, and supervision to do so. The bamboo table I envisioned would have to be made in my small NYC apartment with a handsaw, rope, a power drill, and creativity. This was an experiment that could have gone terribly wrong, but to my surprise it came out exactly how I envisioned so I want to share with you the step-by-step instructions in case you want to make one of your own. Assemble the materials you will need. 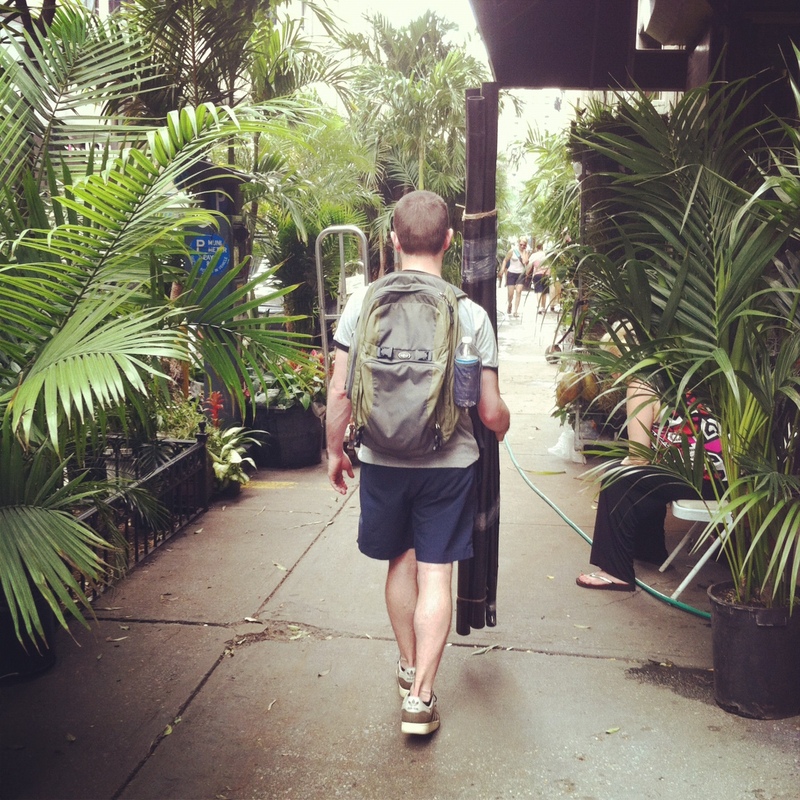 My board is 6’6″x 19″ so I needed to buy two 6′ long pieces of 2″ bamboo. I went with black colored bamboo because of the sleek look. You will also need three 1.5″ x 5′ support beams. The florist I went to sold them in bundles of three so I had some extra left over (perfect if you slip up or crack the bamboo). 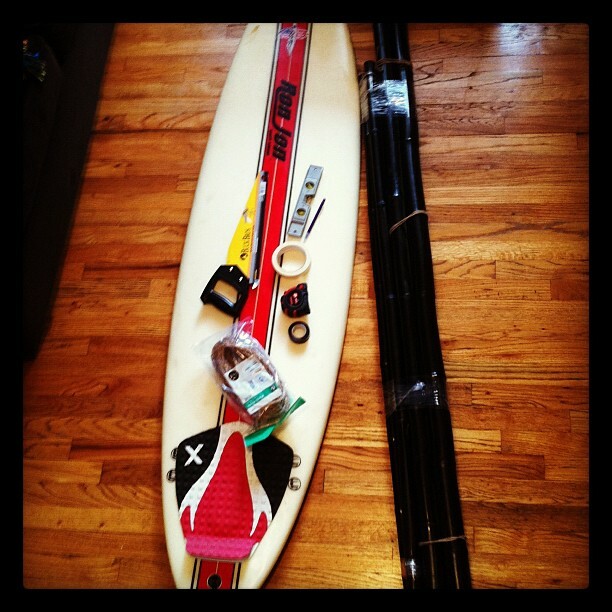 Bamboo – depends on the length of your surfboard but I needed two 2″ x 6′ pieces and three 1.5″ x 5′ pieces. Make the calculations according to the size of your board. Long screws with washers & nuts – 8 of each. The length of the screws are determined by the thickness of the legs and support beams added together so take the measurements to the hardware store for the exact fit. Take the 2″ x 6′ bamboo and mark it at 29″ and cut. You will cut four of these for the legs. Make sure the cuts are level because the bamboo is not 100% straight. Be careful not to split the bamboo when cutting. You can use masking tape to keep it from splitting if you are using a handsaw. Just wrap it at the bottom of the 29″ mark and cut above the tape line. It’s best to have help here so that one person can cut and the other can support the bamboo as you cut. For the top cross-supports (where the board will rest on) you will need to cut the 1.5″ x 5′ bamboo at the thickness of the width of the middle of your board. My board is 19″ wide so I cut two pieces at that length since the nose and tail are thinner than the middle of the board (Note: You might have to make measurement adjustments according to your board’s dimensions). The other two 1.5″ x 5′ pieces are kept in tact for the bottom supports. Tip: Measure twice, cut once! Now that all the pieces are cut you will need to put it all together. You will need an extra set of hands here too. You can reward this person with a cold beer afterwards (not during!). Take the bamboo legs about 2″ from the top, mark and drill a hole on each side for the screws. Repeat for all three additional legs. Next, take the 19″ cross-supports and mark and drill holes so they align with the holes from the legs. Do the same with the other cross- support. This is where you will rest the board which will be your tabletop (face down or up, depending upon the rocker or if you have a track pad on the top of your board). For the bottom supports, measure about half way down each table leg and drill holes on both sides from the inside of the legs. Take the long 1.5″ x 5′ pieces and drill holes on both ends to align with the leg holes. Repeat with the other piece. Take the time to measure everything and drill carefully. The bamboo is strong but soft at the same time and you might drill through the other end in a crooked manner. I found it’s best to drill each hole separately and with care. Once all the holes have been drilled, take your long screws, washers and nuts and put everything together. You will want to screw everything tightly but not too tight to avoid splitting the bamboo. To finish it all off and give it that decorative and beachy look, take the manila rope and tie it around the intersections of each bamboo piece to hide the screws. 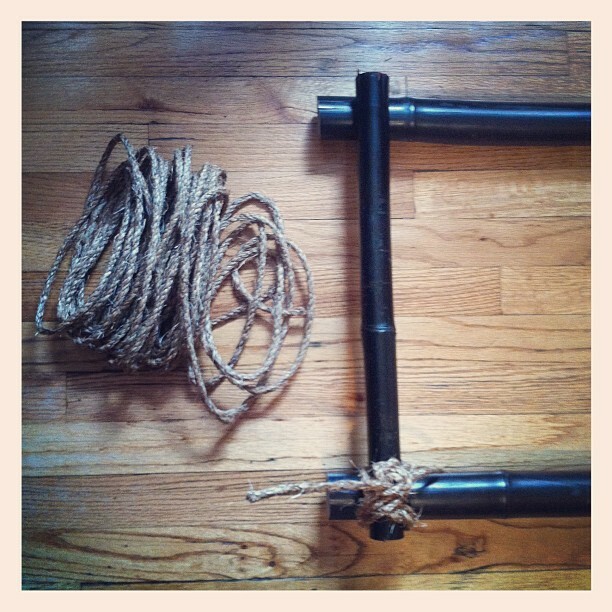 You can also use brightly colored rope for a more edgy and artsy look (be creative!). Tie the ends of the rope and seal them off with clear tape so they will not fray. If the rope is made of plastic material, you can use a lighter to melt the ends. DO THIS OUTSIDE AND WITH CAUTION! And voilà…you have your very own surfboard table! 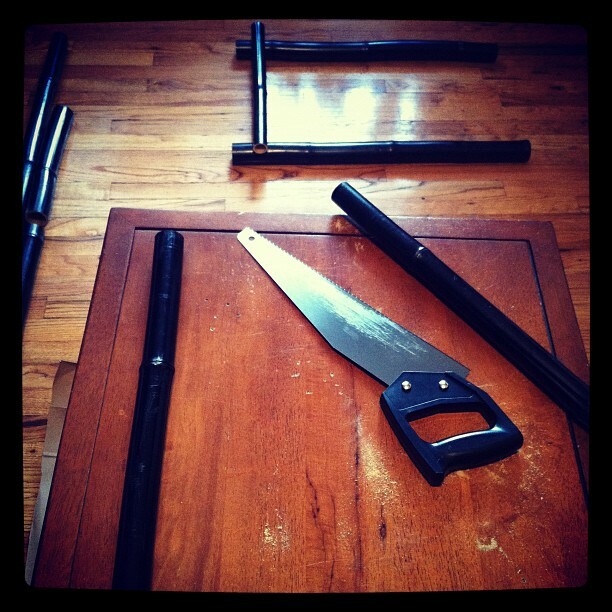 * YORK SURF does not know how much weight the table can hold so do not over load. 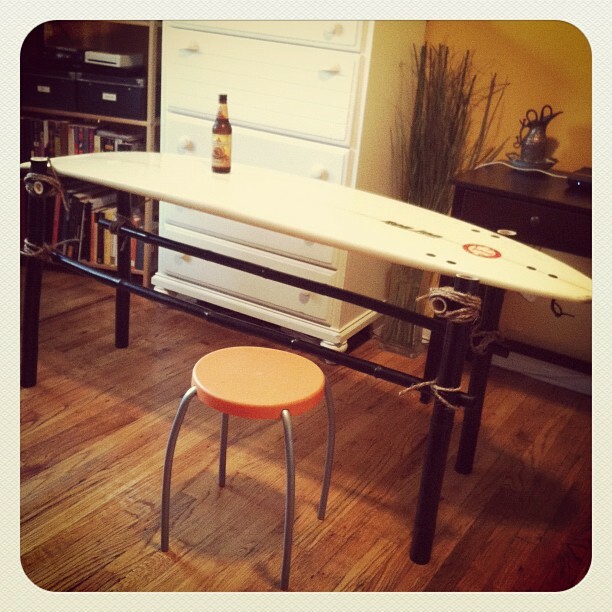 Also, YORK SURF is not liable for any injuries you or your friends may sustain while making your own surfboard table. Do so at your own risk.